The Palace of the Grand Master of the Knights of Rhodes is a medieval castle in the city of Rhodes, on the island of Rhodes in Greece. The site was previously a citadel of the Knights Hospitaller that functioned as a palace, headquarters and fortress. 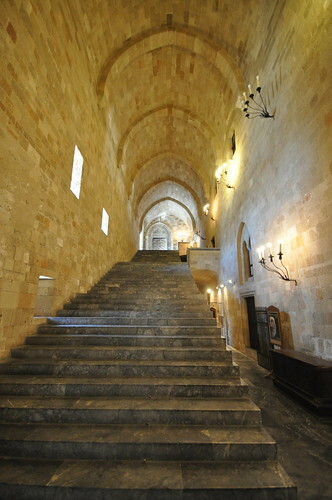 The palace was built in the early 14th century by the Knights of Rhodes, who controlled Rhodes and some other Greek islands from 1309 to 1522, to house the Grand Master of the Order. After the island was captured by the Ottoman Empire, the palace was used as a command center and fortress. Some parts of the palace were damaged by an ammunition explosion in 1856. When the Kingdom of Italy occupied Rhodes in 1912, the Italians made the palace a holiday residence for the King of Italy, Victor Emmanuel III, and later for Fascist dictator Benito Mussolini, whose name can still be seen on a large plaque near the entrance. On 10 February 1947, the Treaty of Peace with Italy, one of the Paris Peace Treaties, determined that the recently-established Italian Republic would transfer the Dodecanese Islands to Greece. In 1948, Rhodes and the rest of the Dodecanese were transferred as previously agreed. The palace was then converted to a museum, and is today visited by the millions of tourists that come to Rhodes.